3 Bedroom rental villa in site of Loch Palm Golf Club! Jah Villa is a rental villa in a site of Loch Palm Golf Club at 40 minuets by car from Phuket Airport,between Patong and Phuket Town. 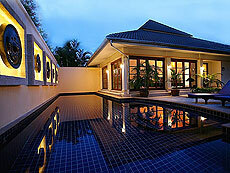 In the villa has 3 Bedroom, living with dining room and private pool. The location is also easy to access to local area such as market, local food restaurant etc,, that makes you enjoy not only for villa stay.